You can ask for a price estimation and a free viewing by contacting 020 3746 3201 or submitting an online request. If you are having difficulties cleaning out and disposing of the excess builders waste following the refurbishment of your house, we are 7/7 prepared to help you. We offer top quality building waste removal Harrow HA in compliance to all regulations. Our waste disposal staff will do all the heavy lifting and loading, and can be very useful for bulky waste clearance and all kind of construction debris removal. Our employees are vetted and qualified to properly deal with your junk. They will turn up with a truck for loading and moving the builders waste to the recycling site. We will recycle as much of your waste as possible. For quick and effective help in removing out undesirable items and rubbish from your house, get our professional waste disposal service today! Better Cleaning Company is an expert cleaning and junk removal company in Harrow with a very delicate strategy to each individual customer. We are always dedicated to the particular demands and requirements a customer comes to us with. This is why our removal services are always so effective and popular. Organizing removal for you will be entirely performed to your deadlines, needs and administrative requirements. We definitely will pack the luggage for you and we will supply you even the packing materials. We are going to find man and van for the moving and will be very mindful for your personal belongings - specially for fine art, important items, ornamental home furniture and hand-made interior goods. In all cases we secure not only the packing procedure, but also the right packing containers arrangement during the travel. If you need personal removal help - like tickets, quickly accommodation or management help with the address change, we can help you, also. 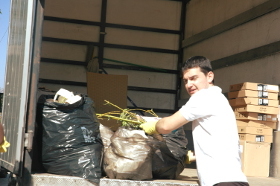 We are seasoned in providing hassle free and quick garden waste collection Harrow HA. We will gather all tree trimmings, grass, hedge, leaves, hay, unwanted plants and weeds, wood and some other garden waste and will load and dispose of it at a good price. Our waste management staff can cope with green waste removal, brown waste removal plus recycling & dumping. Rubbish Collection In Harrow HA. Quick Bookings! Benefit from the many years of experience that Better Cleaning Company had offering rubbish removal Harrow HA services. We are the most trusted rubbish waste carrier in the area. Our experienced two men groups will arrive on time and commence loading immediately if you are fine with the price given. We have very affordable fees and assure fast arrival if you want same day service.Call now and 020 3746 3201 we will also recycle instead of you, so leave the rubbish collection to us and book our service now!